We are the definition of GREAT Barbecue. 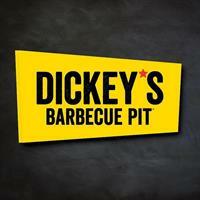 Founded in 1941, Dickey's Barbecue has taken a local Texas style barbecue concept and grown to the largest barbecue chain in the United States with more then 570 locations nation wide. We Fouce on Passion, Great Service, Speed because time is important, and at the end of the day, GREAT Barbecue. We are so happy to be able to deliver this love of High quality menu choices to our local community. This location is owned and operated by a local and will always put our guests first!